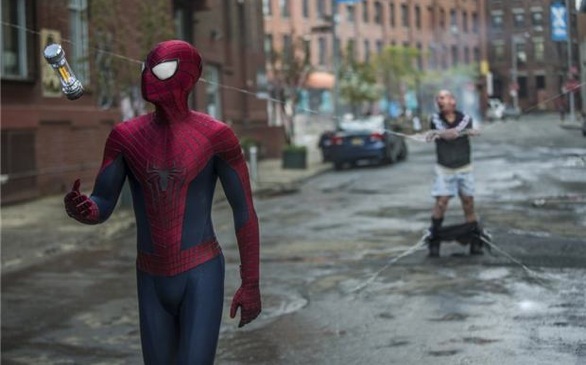 3 Things You'll Love About The Amazing Spider-Man 2: Don't worry -- no spoilers! Peter Parker is back and better than ever in The Amazing Spider-Man 2, which is scheduled to release in theaters Friday, May 2. Campus Circle had a chance to check out the film on April 24 at an advanced screening. So, without giving ANY spoilers away, we're going to tell you why you need to grab your favorite Marvel Spider-Man T-shirt and stand in line before midnight on May 1 to check out the franchise's second installment. 1. Peter Parker is the Peter Parker comic readers remember. Unlike Toby Maguire's portrayal of Spider-Man as a quiet, shy, socially awkward and somewhat dopey guy, Andrew Garfield is faithful to the comics in his portrayal. Yes, Spider-Man is awkward (most times around Gwen Stacy), but he's also sarcastic and cracks jokes while he's fighting crime and swinging from building to building. 2. The special effects are amazing, especially in 3-D. If you have the chance to see the film in 3-D, DO IT! The crime fighting, the web slinging, the diving from buildings -- wow! While watching the film, it almost feels like you're on a roller coaster ride that you're in no hurry to get off. 3. It doesn't run too long. Yes, in my book, this is a wonderful reason to see any film. Movies these days seem to have a tendency to drag on and on, even the great ones, like Lord of the Rings: Return of the King and The Wolf of Wall Street. However, The Amazing Spider-Man 2 is wonderfully paced and ends at an appropriate time. Ok, that's it; that's all you get. Of course, there are many more reasons why this movie is certainly not a waste of time or money, but what fun is it to divulge all of the plot's twists and turns so soon? However, if you want a chance to see the The Amazing Spider-Man 2 BEFORE it hits theaters, click here! Also, you have the chance to win a pretty cool Spider-Man prize pack if you enter our sweepstakes by clicking here.